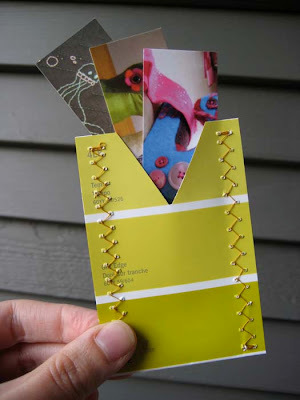 This Moo minicard holder takes five minutes to make. However, depending on how you look at it, it actually took me eight months and five minutes to make. I bought a pack of Moo minicards back in January, but hadn't got round to sewing this up until today. 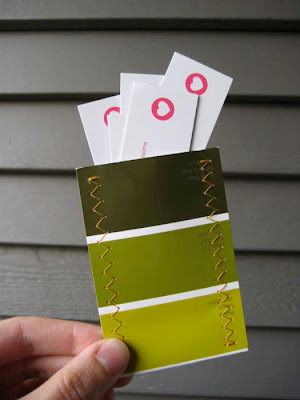 This is so easy to make, I feel silly even writing up a tutorial - just take a paint swatch in your favourite colours, cut a shape out of one end (it helps to be able to pull the card out afterwards), then fold it in half and sew up the sides. Turns out a paint swatch is the perfect size for Moo minicards. Which is nice, cause they're both list of "tiny pieces of paper I can't get enough of". Nicely printed greeting cards and cute notebooks are also on that list. You could make up a few of these holders in various colours to keep different kinds of minicards in - greens for cards featuring your Etsy products, reds for your photos, blues for portraits... or if you're using them all for your craftwork, you could do yellows for jewellery, pinks for toys, oranges for clothing... Then, depending on who you're giving it to, you'd quickly know where to find the card that's is best-suited for them. I love this idea. Now I just need to collect some paint sample cards!